The big rusty thing (aka the coupler that connects the propeller shaft to the transmission) is broken. 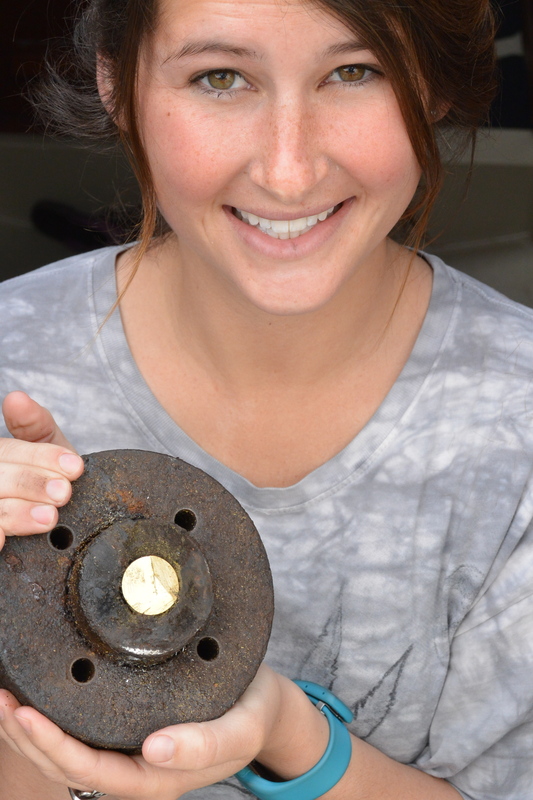 Back in the day (last July) the rusty thing failed on us in the middle of the Gulf Stream. With a little, or possibly a lot of help, we discovered this by completely taking the coupler off/apart to see it up close and personal, post-failure. After several attempts to remove the stubborn rusty thing properly, it came down to cutting the prop shaft itself for extraction. It was a sad, and terrifying moment. Were we excited about it? No. Were we going to sink right there at the dock? No. Did we want to sink right then, right there? Maybe. Are we completely being held hostage at this dock until further solutions? Yes. 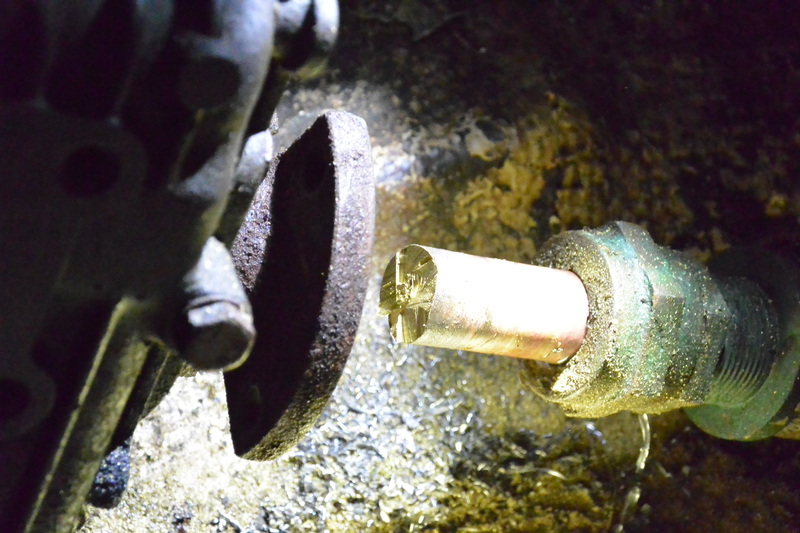 It’s a long story, and you probably are feeling like there was some way… some how… to remove this coupler without cutting the shaft. Some kind of better solution maybe? Well, there wasn’t. We now have a new (not rusty) “rusty thing” en route, and should have enough room on the original prop shaft to reconnect the new coupler. We are pretty sure the cause of the couplers failure, was due to our misaligned engine. This is Katie’s fake smile. This is where the big rusty thing once lived. This is the inside of the big old rusty thing. This is our prop shaft exiting the big rusty thing. Not cool. TO BE CONTINUED. I have videos of this whole process, unfortunately the internet has not been friendly enough to let me share them with you. Reggie is sweet, he does not, however, know how to play poker. Good luck with that rusty thing. Our big &5(?/@%< rusty thing dropped off twice during our Loop, once while entering a lock. So, feeling your pain, Memsahib has hit the donate button. There are flexible thingies (couplings) designed to go between the big rusty thingy (output shaft flange) on the back of the transmission and the big rusty thingy (propeller shaft flange) on the propeller shaft. the flexible coupling would do two things for you: 1. take up some of the space lost by cutting off some of the prop shaft so that maybe your shaft is still long enough to be used, 2. help correct for some misalignment. When installing the new prop shaft flange, dimple the shaft below the setscrews and safety wire the setscrews. If you are out of the water, this is a good time to replace the packing in the packing gland and to check and replace the cutlass bearing. 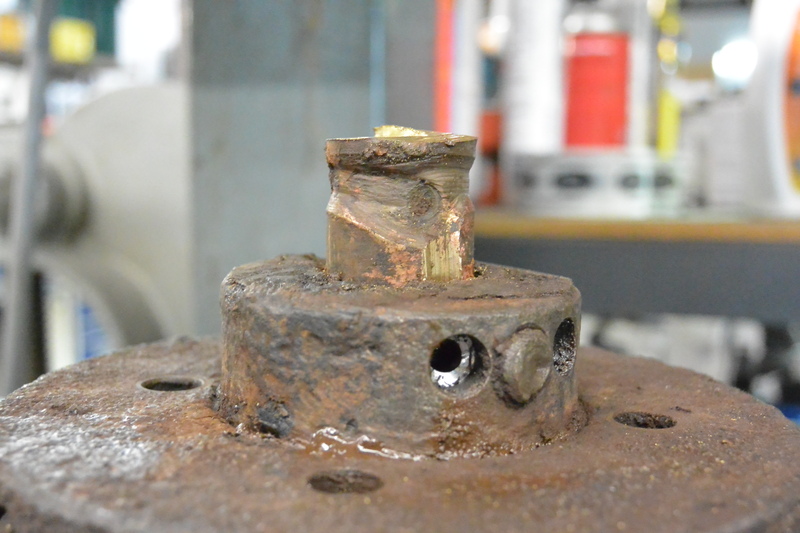 It could have been vibration from a loose cutlass bearing causing your problem. 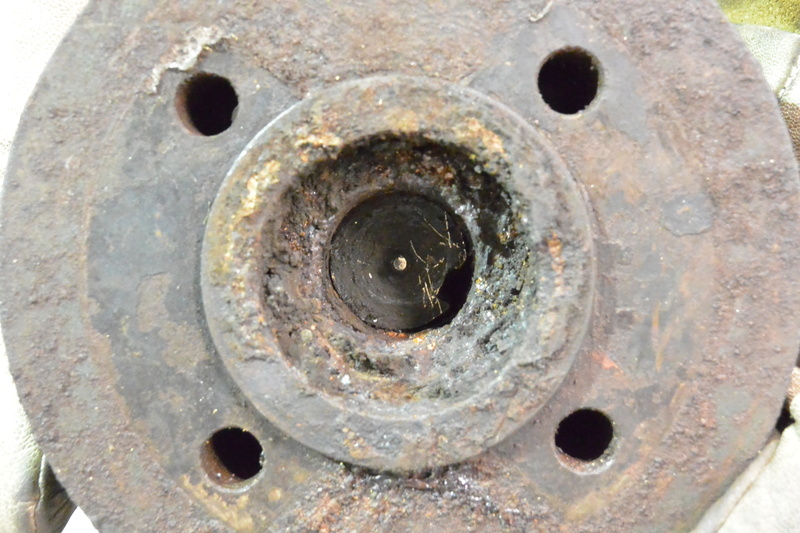 I suggest installing a shaft zinc on your propeller shaft between the packing gland and the prop shaft flange. this will give extra galvanic protection plus help keep the shaft from falling out of the boat and leaving a big hole into which water comes if/when the shaft comes loose. If you are still in the water with the loos shaft, DO IT NOW! or lock a pair of vise grip pliers onto the shaft (will mar it) or place a hose clamp on the shaft or something. If that shaft were to slide out now, you could lose it and its propeller, but that would likely be the least of your problems! if you need an inexpensive yard on your way north, Green Cove Springs Marina. Many great resources, too. our boat is currently there. Oops, now me previous comment shows up, before it did not. I apologize for my jumping to a false conclusion. Hope you get Louise shipshape soon. Did big Rusty have a key and keyway? Looks like not. Looks like Mr. shaft was affixed with a set screw only. Curious because my 1960 Pearson ate her own Rusty thing about 10 years ago. Come to find out, the previous owner grabbed an unmachined coupler and just ran a set screw into the side and called it done. I do so enjoy your adventure. Each chapter (post) is an enjoyable read, and sometimes morphs into a page turner: The Big rusty thing just broke *&^%$#@! ; where’s the hack saw; which part do we cut; who sells replacements; how long til we get it; how do we install it; will it fit; will it work; will we be stranded in this humidity forever? Your blog is one of the best. It shows the rawness of survival. Getting buy with little (money, experience), pushed further counter-clockwise by the plaguing desire to see what’s around the next bend, or inside the next harbor.